Buying a barn or shed is an investment not only to improve your property, but also to improve the quality of life for your animals. As an investment, you want the building to look good and last for a long time. Many of the sheds and barns that Deer Creek Structures builds feature cypress board and batten siding. 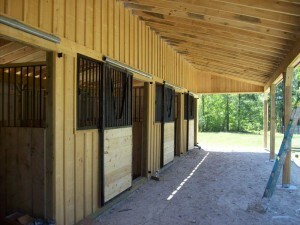 This is a popular option for farm and ranch buildings because of the many benefits of cypress siding. 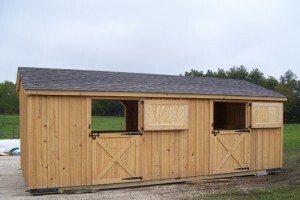 This wood is naturally resistant to both rot and insects, making it an excellent choice for a barn, shed or other outbuilding. Natural oils that are contained in cypress repel termites and other damaging insects, and cypress siding holds up better than siding made from other woods like pine. Cypress siding also lasts for a long time with basic maintenance. As with any wood siding, occasional staining, varnishing or painting is required to protect and preserve the wood. Cypress also resists warping because of its density, which is an important trait in any wood that is used for siding. With the proper care, cypress siding can last decades or longer. 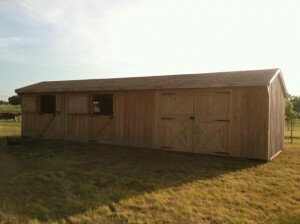 In fact, there are many barns with cypress siding that are more than 100 years old with siding still in good condition. Another benefit of cypress siding is energy efficiency. Cypress grows slower than some other trees, which results in a dense wood. This thicker wood means that the siding itself serves as a more beneficial insulator, helping keep temperatures moderate throughout the lifetime of the structure. It also means that heating and cooling systems don’t need to work as hard to achieve the desired temperature and maintain it, helping keep your energy costs down. Beyond all the benefits, there’s the simple fact that cypress board and batten siding is an attractive option. Board and batten siding is installed vertically instead of horizontally, and in addition to being good looking, this siding style allows the siding a little bit of movement without causing damage as the wood contracts and expands due to changing humidity and temperatures. 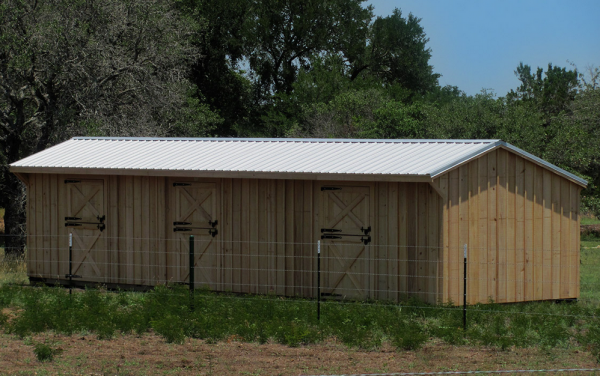 Deer Creek Structures has been offering quality barns, sheds and other farm buildings since 2005, and our buildings are highly customizable to meet your exact needs. Call us today at 254-546-2276 to learn more about our high-quality buildings.